Getting back to work after the holidays can be a struggle. Some people even suffer from the post-vacation blues. 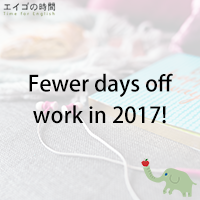 I don’t mean to make you feel worse, but it seems we will have fewer days off work in 2017. In Japan, there are sixteen public holidays established by law, four of which fall on a Saturday this year. When a legal holiday falls on a Sunday, we get the following Monday off. Unfortunately for many workers and students, this rule doesn’t apply to Saturday holidays. Now, I’ve used the word “fall” a couple times today. It’s used to mean to happen on a particular day or date. For example, National Foundation Day is celebrated on February 11. It’s Saturday this year. National Foundation Day falls on a Saturday this year. I was born in June and my birthday this year falls on a Friday. National Foundation Day falls on a Saturday this year.